It has been a few months since we went further North than we've ever been before, but the passion the country gave me for all things Icelandic has not wavered one bit! I could speak to you for hours ad-nauseum about its scenery, mountains, beaches, buildings and people but you know what they say... A Picture Paints a Thousand Words. It's a cheesy one-liner but it really is true. We visited Iceland in February, and were greeted with a certain amount of pessimism from the car-rental kiosk. When she mentioned that we should probably be spending all our time in the hotel because of the impending storms heading towards the island, our hearts sank. We had come to the small Scandinavian island to explore and have a life changing experience! We weren't going to let a storm get in our way! 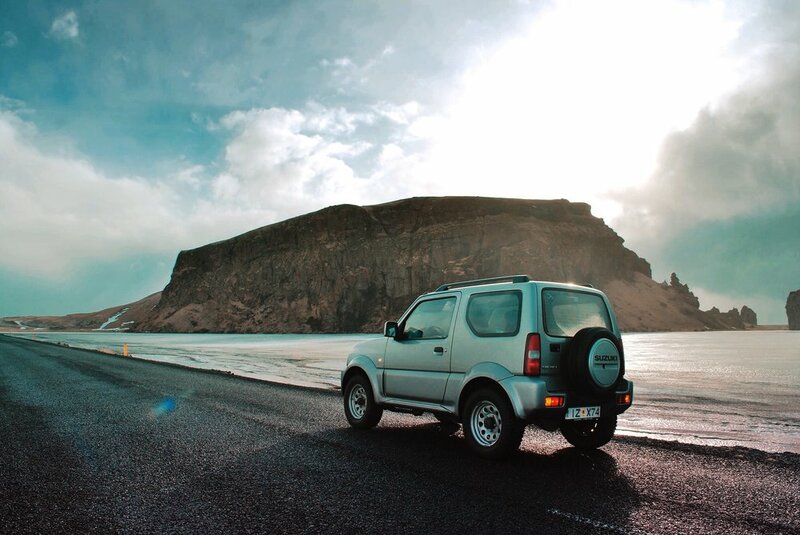 We jumped in our Suzuki Jimny and headed towards Reykjavik and our apartment. We awoke the following day with plans to head into the wild, but instead we were greeted with sideways snow and very strong winds. We explored the city and planned our adventures. On reflection the extra day of relaxation was perfect. We found our feet in the country and had a day to plan and check our destinations. On day 2 we woke early and got on the open road. Iceland's roads are interesting to say the least. The main ring road which goes all around the Island is their equivalent to a motorway, but most of it is single carriageway and some of it is pretty sketchy at times. The road climbs for around 50km and eventually reaches the summit of a mountain before dropping down to Soffa. On the summit we were met with snow drifts and a disappearing road because of the settling snow. Our little Jimny was perfect though and handled great. We stopped in Soffa for some fuel and the application of some Rain-X and headed towards our first destination, Reynisfjara Beach. 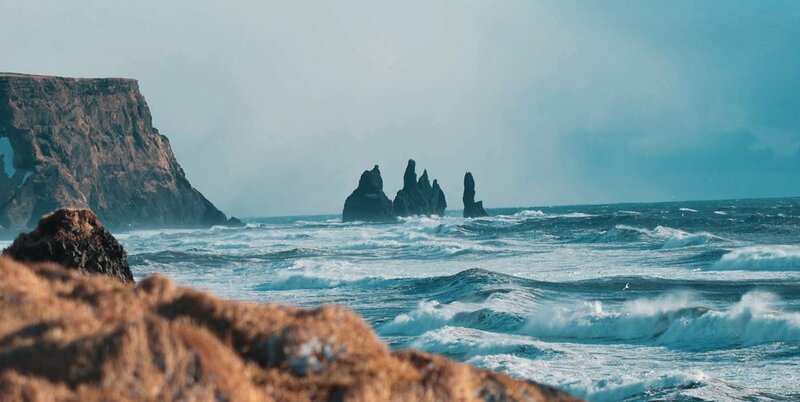 Reynisfjara Beach is one of the most Southerly points on the Island and is 180km from the capital. 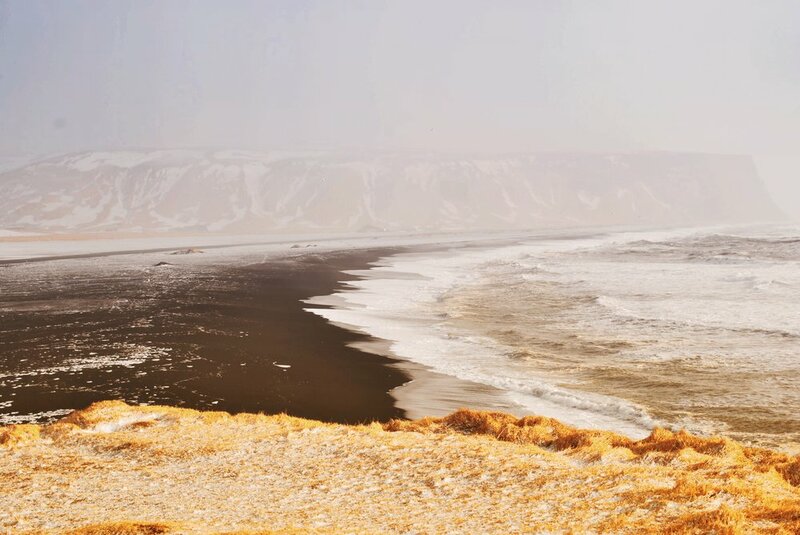 It is famous for its black expansive sands and basalt columns. Legend says the columns are trolls that once pulled the ships out of the sea, long since turned to stone. The roaring waves can be unforgiving and the sneaker waves can literally sneak up on you and make you very cold and wet instantly. We ventured onto the beach as well as climbing up onto the headland to view the standing columns from above. After we explored the coastline and beaches we heading back East for a short time and stopped at the tenacious Skogarfoss Waterfall. 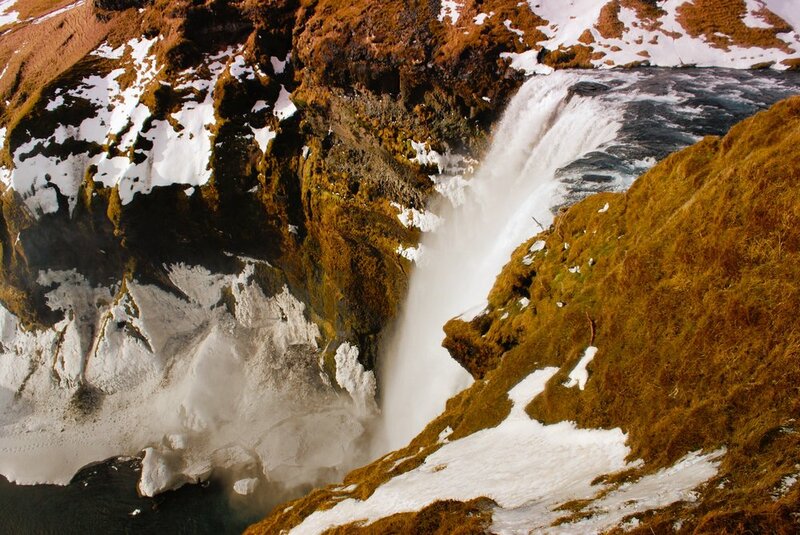 At 60 metres high and 25 metres wide it is one of Iceland's largest falls but also one of its most accessible. It is right off the main road and you can walk right up to its cascading icy waters. Just be prepared to get soaked! The viewing platform at the top of the fall is amazing, with the most amazing views available if you put in the effort to climb the 527 steps. It was very icy and slippy when we climbed so it is advisable to get some crampons or chains to pop over your footwear. 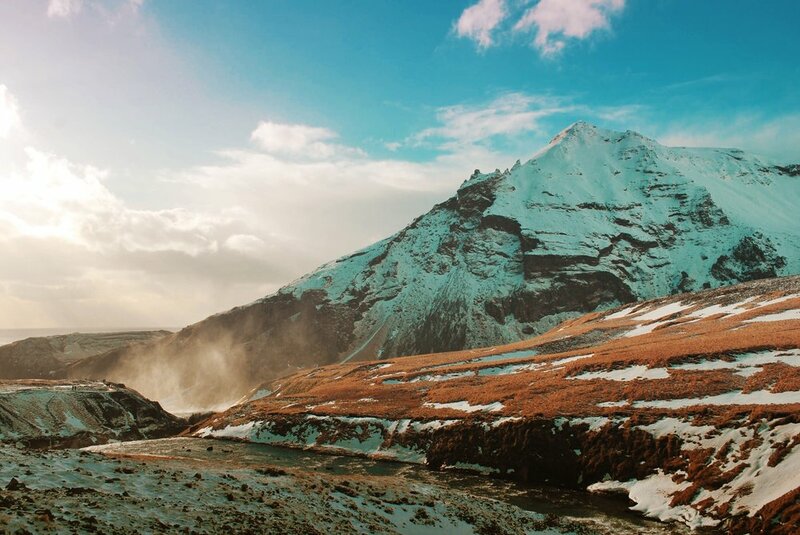 You can continue walking along the Eyjafjallajokull Glacier and see 20+ more waterfalls and rapids. We hiked for a short time and couldn't believe how few people did this, evident by the way the tracks disappeared quickly in the snow, just tens of meters away from the viewing platform. We were more than rewarded by just walking a little bit further as the view was staggering. You could see snow peaked mountains, cascading rapids, waterfalls, lowlands, sandy beaches and the Atlantic swells all in one vista. After we had climbed back down we heading towards something I was extremely excited about. One of Iceland's most famous attractions and strangely one that is man-made and very unnatural. 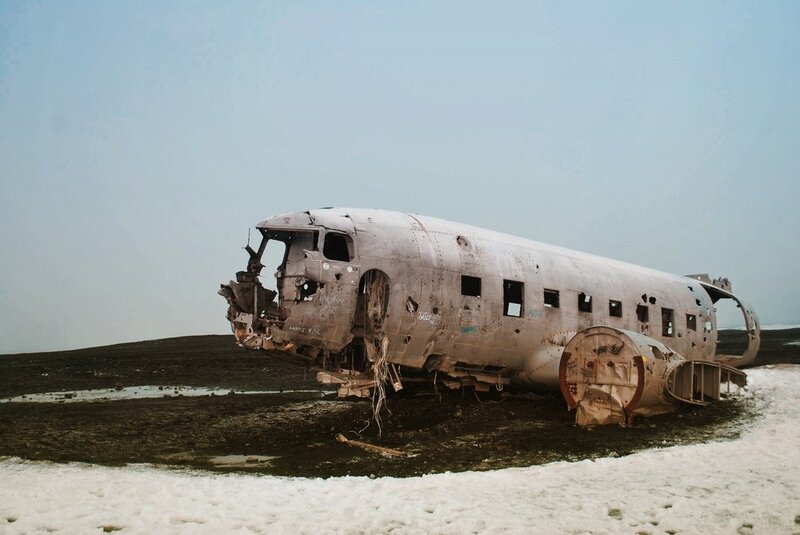 The Solheimasandur Plane Crash. 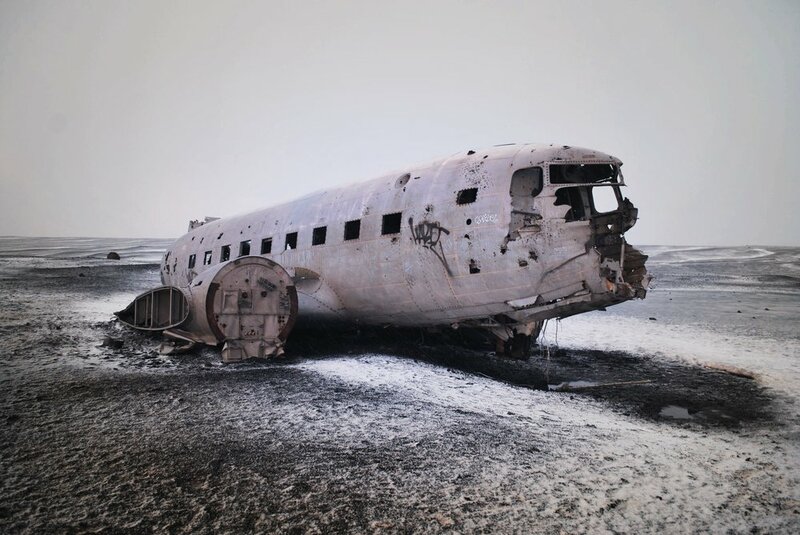 In 1973 a United States Navy DC Plane ran out of fuel and crash landed on the beach. It remains there to this day. It's about an hours walk from the main road along a well marked path. The walk is across a desolate black volcanic landscape which gave us many challenges including driving hail, wind and rain. 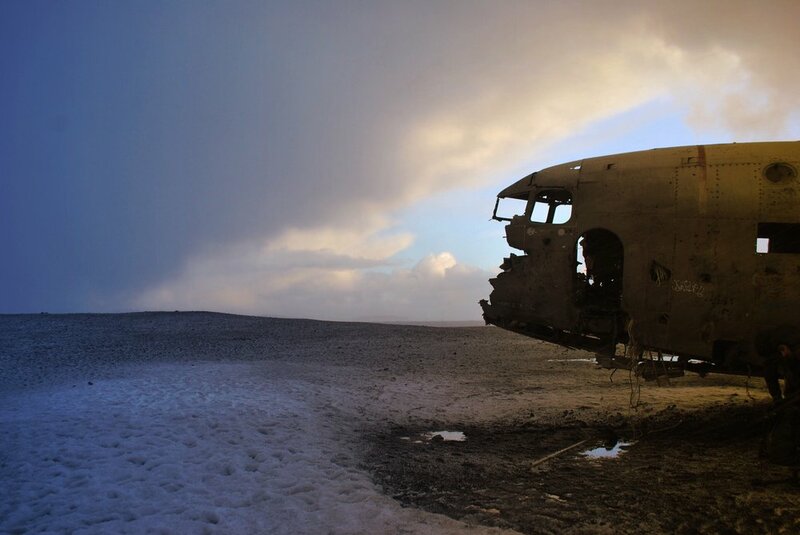 The spectacle when we got to the crash site was well worth it. From there we headed back to Reykjavik and made our plans for the next day. The following day we headed North and towards to Thingvellir National Park. This is the site of the Mid Atlantic Ridge and the meeting of the American and European tectonic plates. This has caused a dramatic landscape with gorges, ravines and lakes throughout the park. The parkland was also home to the ancient parliament of the country between 930 and 1798 they met in the Fissure Zone. The whole area has immense cultural significance for Icelandic's. When we were there the area was deep in powdery clean snow. It made the whole experience so special and rememberable. The Island tested us more than you could imagine. The weather was brutal and harsh. We were very prepared with thermals and gear but it was still freezing cold. The driving was challenging with many locals staying off the roads during the storms and we pushed ourselves to see some amazing sites in the short amount of time we had. We'd love to head back and see the Aurora at some point as the storms created too much cloud cover and also we'd love to see the North of the Island.